In the summer, Dave Kerr works for a Toronto stockbroker, plays tennis and handball to keep in trim. In a sport which batters and bruises players so badly that the average hockey player is forced to retire after five years, he is outstanding. Only one stitch has been taken in his anatomy in the past four years. • Toronto-born goaltender Dave Kerr was 28 in March of 1938, playing in his eighth NHL season when Time put him on the cover of the magazine. He was the second hockey player to make it there, after Lorne Chabot in 1935, his only year in Chicago. For Kerr, 1937-38 was his best season to date, though he ended up runner-up for the Vézina Trophy to Boston’s Tiny Thompson. 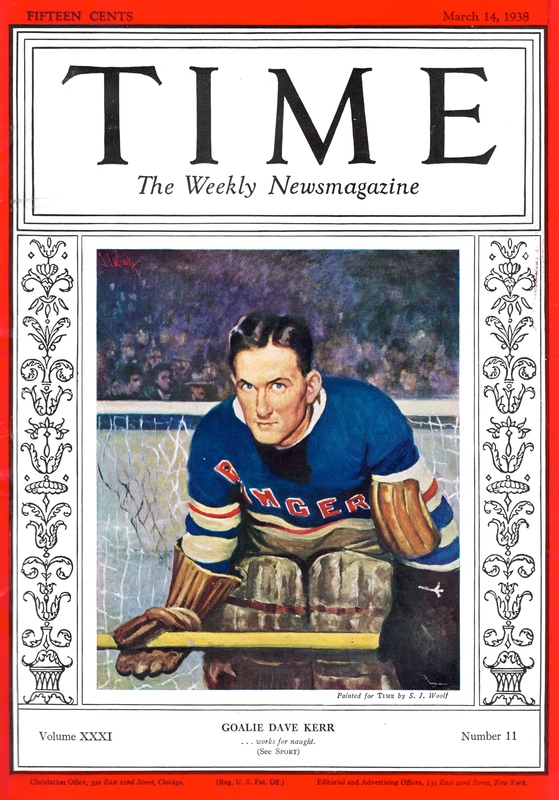 He had to wait until 1940 to win it for himself — the same year, as it happens, his Rangers won the Stanley Cup.